zaeshe3536658 Italy License Plate, Place of Miracoli Complex with the Leaning Tower of Pisa in front Tourist Attraction, High Gloss Aluminum Novelty Plate, 6 X 12 Inches. zaeshe3536658 Italian License Plate, Designed Masks for Carnivaof Venice Baroque Style Gondolas River Italy Landmark, High Gloss Aluminum Novelty Plate, 6 X 12 Inches. 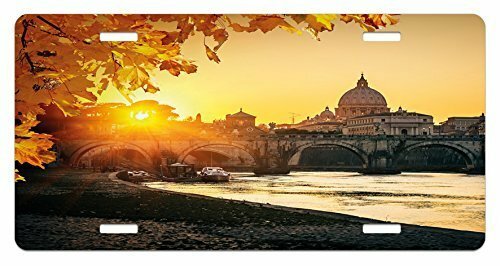 zaeshe3536658 Landscape License Plate, Night Panoramic View Vecchio Bridge Florence Italy Colorful Fireworks, High Gloss Aluminum Novelty Plate, 6 X 12 Inches.